The extension of the Lithuanian National Master Plan towards maritime space was the first attempt to integrate the marine related data and spatial solutions into an integrated and comprehensive maritime plan. The official planning process was initiated by the Ministry of Environment of the Republic of Lithuania and based on the Resolution No. XI-1571 „Concerning Supplement of the General Plan of Republic of Lithuania by marine areas“ which was issued by the Parliament of Lithuania Republic in 2011-06-30. The tender for the development of the National MSP was won by the consortium of planning agency “Atkulos Projektai”, cartography office “Valstybės Žemės Fondas” and led by the Coastal Research and Planning Institute of Klaipeda University in 2012. 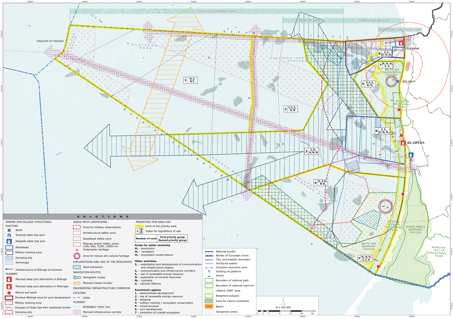 Spatial solutions (the Plan) was prepared in 2014, with the final adoption by the Seimas of Republic of Lithuania takin place on the 11th of June 2015. Supplement of the national Master Plan, legally binding. The adopted MSP is the highest level strategic planning document directly influencing the planning of the marine activities. The area under the planning process consist of Territorial (TW) and adjacent waters, exclusive economic zone (EEZ), including the continental shelf of Republic of Lithuania according to the Resolution of Government of Lithuanian Republic (Žin., 2004, Nr. 177-6573). The development of the national MSP was inspired by EU funded projects related to the developments of the offshore wind energy market, network of marine protected areas in the SE Baltic Region. Ongoing BSR projects focusing on the development of MSP principles, MSP Directive idea discussed on an EU level and private initiatives of OWE developers created substantial pressure and demand for the proper organization of existing and management of emerging marine activities. Experience of the scientists of Klaipeda University and political will of Ministry of Environment has resulted in a well-defined objective – to have the spatial plan of the marine areas of Republic of Lithuania. The Lithuanian MSP is a strategic planning document aiming to create the favourable conditions for management of the sea uses, fostering the blue economy and securing the good environmental status and marine resources of the marine areas of Republic of Lithuania. The plan was an extension of existing terrestrial plan of the country and therefore finalizes formal system of the planning, and at the same time ensures the proper link between land and marine based activities. The Maritime Spatial Plan of Lithuanian Sea is based on the 5 thematic maps/schemes designating the priority areas for different uses, securing the ecological balance, reserving areas for national needs, framing the distribution of technical infrastructure developments as well as identifying the main objectives of regional development of the coastal zone. 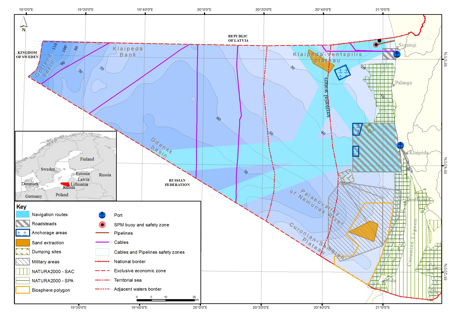 The proposed spatial allocation of marine uses has to undergo a strategic environmental assessment (SEA) including an official public consultation process. Official transboundary consultations with Swedish and Latvian authorities - parties of SEA process were launched by Lithuanian Ministry of Environment.